Home » China » What Products are Made in China? 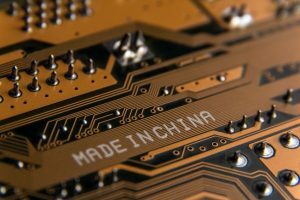 China produces and exports a massive amount of electronic devices and components. They make cell phones, tablets, computers, optical readers, televisions, microphones, circuits, and semiconductors. Most of the electronics you use in your everyday life contain components that are produced in China. Many different types of clothing are manufactured in China. Anything ranging from t-shirts to suits can be made in China. Undergarments, pants, shorts, shoes, and various accessories such as purses and wallets are also exported. There are a wide variety of toys that come from China. Race cars, dolls, action figures, model kits, and stuffed toys are brought over to the U.S. from China. China also manufactures a good deal of furniture, including seats, chairs, couches, sofas, massage beds, table sets and more. Many steel, aluminum, and plastic parts are machined in China. CNC machining, plastic injection molding, castings, forgings, and fabricating are just a few of the many production capabilities China has. Volvo, Buick, and Cadillac manufacture and import some of their models from China. Many replacement parts are also brought over for many different companies. China exports huge quantities of tea, soybeans, spices, ginger, and garlic. Some canned foods are also exported.